L’dia on Bass, the First Lady of Four Strings, brought the house down with her brand of hip-shaking, string-breaking thunder at our booth at MusikMesse. She recently launched a new website, and wanted to make sure that all the PreSonus fans out there knew about it! 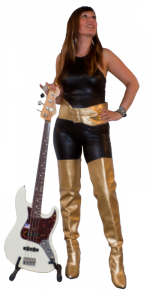 L’dia on Bass is an enthusiastic Eureka and Studio One user, and we’re lucky to have her representing us. Check out her new site… she gives lessons, and you could learn a lot!